Our goal this time was to find the best marine speakers. We took our long list of contenders out onto the open waters. With marine speakers they have to withstand the elements easily. They also have to project the right sound power and quality. We tested each one thoroughly to make sure we came up with the best ones available. After hours of researching on boats and playing loud music, we confidently present our top three gold, silver and bronze products, along with our budget buy. Each one earned its place by being an outstanding product that met all of our carefully thought-out criteria. Here are the details on each of our winners. If you’re looking for a fantastic boating speaker, try out the Kicker MK654LCW 6 ½-inch 2-Way marine speakers. They are great for outdoor use—particularly on boats due to their sturdy weather-resistant structure. On top of that though they sound great in a variety of different settings and the light options are fantastic. The first thing that hit us about these speakers was the look. With multi-color LED lights, we can picture using these speakers on the water in the dark. A colorful party nights on the family boat will be that much more exciting. The lights are removable for a more somber experience, or you can just not turn them on. What is nice about these is that you can’t see the LED lights until you actually turn them on. If you’re trying to impress, these are perfect. There are modes you can easily set for the lights—from strobe to pulse. In total, the controller gives 19-modes to pick from. There are 20 different colors to choose from with the controller also. To change them on the fly you need a separately-sold remote, but it isn’t too pricey an add-on so the Kickers still made our cuts. The included grilles are customizable. They come in both charcoal and white so you can chose which ones fit best with the look of your boat. If you need them custom painted to match your boat’s interior, that’s possible too. The Kickers come in a variety of sizes—4-inch for particularly small spaces, 10-inch for larger areas and the perfect size the 6 ½-inch. We found that these were perfect because not only did they produce a lot of clear sound, but they also fit into just about every boat configuration we found. We used a template to imagine where the speakers would be installed on our test boats and these looked great and were effective. Beyond the fun colors, we scrutinized the sound. 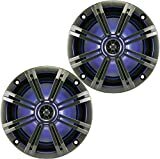 The Kicker speakers are armed with a maximum power of 195 watts and a RMS of 65 watts. We found that this is a powerful and effective level for marine use. Not only was it able to broadcast over the waters loudly, but it was clear and crisp in sound the entire time. We tested a lot of different music on the speakers, and even a few soundtracks, to see how well these performed. On top of boat testing, we also tested them outside on land. Remember that they are marine speakers which means they are made for boating, but they should be able to handle any outdoor station. We wanted to be sure that outside they could produce as much clarity and power as they did on the waters. Luckily, in every setting they performed great. These speakers weigh 6.65-pounds each and they require a mounting depth of 2 7/8-inches and hole of 5 1/8-inches. What sold us was their durability. Though they are just 6 ½-inches in diameter, don’t let size fool you. These speakers are specially treated with UV-protection on the coaxial injection-molded cone structure. The baskets and grills are coated with Santoprene® so they can withstand the elements. They are suited for salt-water, UV rays and high moisture. 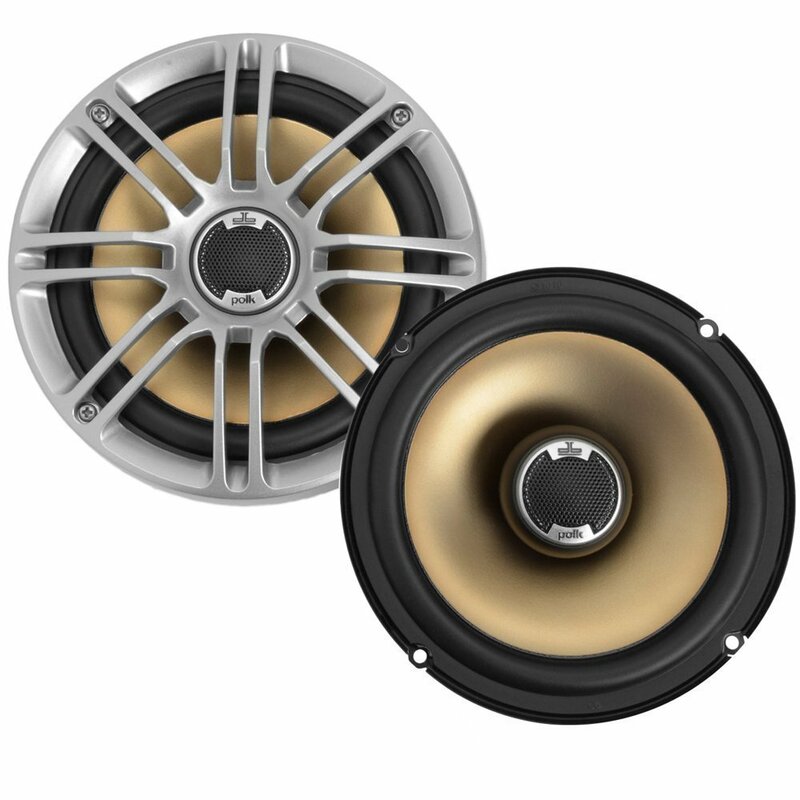 All hardware within the speaker is constructed from 316L stainless-steel and is rustproof. We loved the 6 ½-inch Kickers because we can see them being useful for just about anyone needing marine speakers for their boat or for general outdoor use. They are powerful, durable and can withstand any weather. Plus, the lights and customization options make them some of the most fun speakers we’ve seen in a long time. 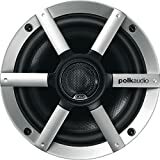 Our silver product for this list is the Polk Audio AA2652-A MM651 UM 6.5-Inch Coax Ultra marine speaker. These speakers made it to the top of our list because of their pro-quality durability on the waters and consistent sound quality. These are great speakers and after much testing, here is what we found. These speakers reached the top of our list because of their construction and durability. They are completely sealed to protect them from water infiltration and damage. They also have heavy-duty terminals that will never tarnish or corrode, regardless of weather. We tested these out on boats and on the beach. We wanted to see how well they would hold up in salt-water and high-humidity. Manufacturers boast that they put all of their speakers through intense UV testing periods and salt fog. We did our own testing with inclement weather and outdoor use and found that the speakers showed no signs of wear. When it came to sound, we also put the Polk’s through the ringer. We used them in a wide variety of locations (boats and otherwise) and played a huge range of songs on them. We wanted to test all types of music to make sure all of our top picks were able to project any style. Whether it was bass-heavy or show tunes, the Polk’s delivered clear sound and crisp vocals. They are constructed to deliver high-performance sound and that’s what we got from them. These speakers benefited from their predecessor’s sound technology. When Polk created their Mobile Monitor (MM) series, they included the AA2652-A’s in the bunch. Because of that, these marine speakers benefitted greatly with sound quality and projection. They have durable grilles that are built as one piece for extra strength. Their tweeters are also swivel mount so you can direct the sound anywhere you want to. These Polk speakers were built with high-tech carbon composite baskets, along with Neodymium motor and oversized coils. They have glass-component cones. This configuration lends itself particularly well to louder sounds. It also gives them a lower mass and that means you’ll hear the finer details of sounds you pump through the speakers. Not only can it create and project them over a long distance, but it can keep them pure to their source. If you’re playing music from your personal playlist, you’ll get an even better quality when they come though these marine speakers. On top of how durable they are, we loved how they projected sound. This was a main reason why they reached our silver product title. We can easily see these speakers on any boat, beach house or outdoor setting. With their power, you’ll likely need minimal other equipment to reach the levels of sound you want. They come in at 4.4-pounds and their dimensions are 6.7-inches by 5.9-inches by 3.1-inches. For installation, you need a 5 1/16-hole with a top-mount depth of 2 5/8-inches and bottom-mount depth of 2 7/8-inches. They project 15-125-watts per channel of sound. We found that this was more than enough to project over the waters. The sound quality was consistently great—always crisp. All lyrics were discernable, which was nice. Some marine speakers can be muddled when you get out onto the open water—not these. They maintained a great volume and power the entire time. If you are looking for great speakers, consider our silver pick—the Polk Audio AA2652-A MM651UM 6 ½-inch speakers. They fit into just about any boat or water-based location. They are durable, powerful and create great sound. For your next boating project, consider these speakers. They can produce the exact sounds you want with clarity and power regardless of where you place them. One more thing about the Polk quality—award-winning wakeboarding boats and Nautiques ski exclusively use Polk products because of how well they stand up to the elements. If the pros trust them, why shouldn’t we? Our bronze pick for best marine speaker is the Infinity Reference 612m 6 ½-inch 225-Watt High-Performance 2-Way marine loudspeaker. These are powerful speakers that are durably built. If you want marine speakers with minimum extra fuss, these may be the perfect option. The number one feature we noted about this product was its sound. This is one powerful speaker. As with all of our test subjects, we took this speaker out onto the open water to test it out. We wanted clarity and power. Happily we got both! The Infinity is built with 225-watt capability at peak power and 4 Ohm impedance. It has a tweeter mounted on its grille that is 1-inch. This alone provided a huge sound when it came to the higher-frequency sounds. The speaker has a sensitivity level that is 92 dB and its frequency response can vary anywhere between 50 Hz to 20 KHz. This definitely was one of the strongest speakers we found and at just 6 ½-inches that’s a pretty incredible feat. It definitely is the one feature that made this the stand-out for us and solidified its standing at our number three pick. On top of sound quality, it also is highly durable. On the water there are a lot of elements to eat away at metal parts and cause corrosion. Because of this, any hardware has to be specially designed to withstand the harsh salt water and salt air. The Infinity speakers definitely were. They have a woofer cone compost of Polypropylene that is bonded to a rigid rubber surrounding plate. This is UV resistant. The design will provide the bass tones we all love to pump through speakers, while still resisting water and the tough sun rays. The basket is polymer, which is corrosion-proof and will never show any signs of damage caused by salt, sun or moisture. We loved that the finish is shiny and constructed to never lose that shine even after long-term outdoor use. The look of the Infinities is also sleek and solid. They have a blue inner core surrounded by a glossy silver shell. They can easily fit into any boat or outdoor wall. As far as looks go they are standard in that they are high-quality and sturdy. The don’t have the bells and whistles of lights or swivel mount like our top two picks do, but they are still a stand-out and a solid choice if you need marine speakers. In the end, as our bronze pick the Infinity Reference 612m speakers are perfect. They are durable and an investment you’ll be happy with for years to come. If you need marine speakers, these definitely are worth a look. Though they are basic in design, what they do —project outstanding sounds—they do exceptionally well. We have another Polk product on our list of the best, and for good reason. Polk has long been working hard to create an all-inclusive listening experience for its users, rather than just speakers. These DB651 models are part of their revolutionary technology and it definitely shows. They don’t have the bells and whistles of our other picks, but they are sturdy, strong and simple enough to work with to make it as our budget product. What we enjoyed about these Poke speakers is their fantastic sound. Just like our Polk silver picks, they benefit from the company’s determination to create the best sounding speakers available. These boast a precise balance of silk/polymer dome tweeters along with mica cone woofers. This constructions allows a smooth sound at any volume. We tested this out on the open waters. We wanted to be sure that no matter how high we played music, it was always clear and crisp in sound. We found that no matter what genre of music we were broadcasting, or at what level we had it projecting at, the Poke DB651s were able to keep up. We never had any static, or reverb to deal with. They also have low-mass 2-layer voice coil made by Kapton. This ensures that they can better handle loud sounds and projecting at a loud volume. Having a great sound is the main thing that put them into our budget pick slot. We had a lot of contenders, but these were definitely the best. 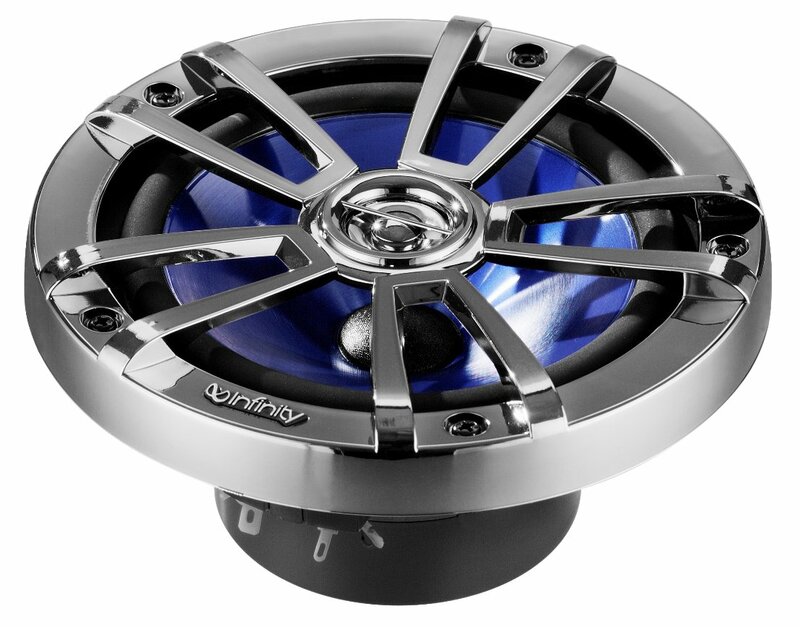 The Polk DB651s are 6 ½-inches and come with 6 ¾-inch adaptor rings for easy installation. Included with the package is a multi-hold mounting pattern. These speakers are made primarily to install easily into boats, but also are good for vehicles. Manufacturers made it a point to stress the universal appeal of these speakers because of their ability to fit into any setting. Install anywhere is quick and easy. They have a special “drop-in” installation that creates flush-mount capability. They are surface-swivel too so you can easily direct sound exactly where you want it to go. All hardware to install them is included in the package. On top of sound and install ease, these speakers are marine certified. This is a special class that makes them perfect for water, or any place where harsh elements are a factor. Manufacturers stated that they put each of their products through rigorous testing of elements. In their lab, they have accelerated weathering tests that are punishing and difficult on the speakers. They test them for salt fog, UV light and extreme temperature exposures to ensure that they perform well in all situations. We did our own testing. No- we don’t have a “weather lab” but we do have boats. We took these speakers, and all of our other contenders, out onto the water to see just what they could do. Happily, due to their construction, the Polk DB651s held up just like manufacturers claimed they would. They had all of the durability features we wanted to earn their way onto our list of the best. Coming in at a great price the Poke DB651s are a fantastic option. They produce a lot of clear sound that is powerful and rich. They are easy to install in a variety of places where weather is a concern and they are durable to hold up to just about anything. If you’re looking for high-quality at a low price point, consider these speakers. They held up perfectly well for us and they’ll likely serve your purpose well also. When it came to our pre-purchase considerations for marine speakers, we primarily were concerned with how well they stand up to the elements. Next, we worried about sound. Sure they needed to be durable, but they also had to do what they were created for—project clear, crisp loud sounds exceptionally well. We then looked at their ease of install and ability to use them in a variety of different locations. Finally, we considered their technology. Technology has come a long way in the past few years and speakers have benefited greatly. We wanted to make sure that the ones we touted were on par or better. Here is a breakdown of our individual criteria. Marine speakers are specifically designed for boats. Just think of all the elements out on the open waters—sun, water, rain, fluctuating temperatures. The demands for marine speakers are rigid. Not only do they have to sound great but they have to be durably built to withstand the elements… numerous elements all day and all night. We tested our speakers in a wide variety of weather systems. We took them out in the high-heat when temperatures were heading into the high 90’s. We brought all color grilles—dark and light—to be sure that the sun never changed their color. We also took our speakers out at night when it was considerably cooler. We tested them out to make sure that they were able to function with purity in warm or cold weather. Next, we focused on potential water damage. Marine speakers have to be ready for lots of water and salt water. As anyone with a boat knows, salt water is corrosive. It won’t affect fiberglass, but try to have metal or any poor quality hardware in it for any period of time. It likely will become pitted. We weren’t just worried about salt water, but salt air too. It can be equally as damaging. We looked at the entire speaker construction. Was it made to withstand salt water and salt air? Was it enclosed to keep water out altogether? Was its make-up heavy-duty and guaranteed to last? Were metals used for construction of speakers coated properly to protect them long-term? We had a lot of demands with our testing when it came to the elements. The speakers that made the cut can easily fit into any boating situation, or beach property in need of marine speakers. After their durability testing, we moved on to the equally important sound quality. We wanted our speakers to be powerful and clear. Many of our choices were powerful. They had a lot of watts and boasted about how well sound would project from them. They fit the bill in terms of power, but when it came to clarity, they lacked. We had a difficult time discerning Rihanna from Fall Out Boy…and that’s a pretty easy thing to do with moderate speakers! We demanded more from our speakers. We wanted them to be as clear and crisp as possible whether we were playing soft music, raucous music or an entire soundtrack. We put the speakers on our list to the test and noted which ones were stand-outs and which ones were duds. We paid special attention to the speakers that were able to project all the ranges—low-, mid- and highs- equally as well consistently. These are the ones that made it to the top of our list. We also put some weight on the look of speakers. We wanted to be sure that any of the speakers we were championing were good-looking and could easily assimilate into any boat or beach house. We didn’t want anything bulky or obtuse. We wanted only the products that were sleek and elegant. They had to be streamlined to easily disappear into the boat’s sides or wherever users planned to install them. That’s the thing about speakers, you should know they are there because of their outstanding sound quality, not because of their bulk. Each one of our picks was weighted up against the streamlined look we wanted. We gave extra points for lights built-in or rotation for adjustment. We are happy with all of our final picks because their looks are professional and high-quality.We also put some weight on the look of speakers. We wanted to be sure that any of the speakers we were championing were good-looking and could easily assimilate into any boat or beach house. We didn’t want anything bulky or obtuse. We wanted only the products that were sleek and elegant. They had to be streamlined to easily disappear into the boat’s sides or wherever users planned to install them. That’s the thing about speakers, you should know they are there because of their outstanding sound quality, not because of their bulk. Each one of our picks was weighted up against the streamlined look we wanted. We gave extra points for lights built-in or rotation for adjustment. We are happy with all of our final picks because their looks are professional and high-quality. Finally, we also listened for the overall power of the speakers we were testing. Some speakers sounded great, but if you were standing on the other side of the boat, you could barely hear them beyond a whisper. These weren’t the kinds of speakers we were looking for. We wanted speakers that had enough power to them to hold up to any party out on the open waters. They had to have great wattage and consistent delivery of sound. This was closely tied with our search for sound quality because we wanted the perfect blend of both to be a critical element to any speaker we heralded. Luckily, that’s just what we found after testing. All of our speakers balance the two perfectly. Finding the best marine speakers was another fun task. We took our contenders out on the waters and to the beach to see how well they would hold up. We tested just about everything possible with them—their durability, their sound, their look and their power. Our goal was to find the best overall marine speakers. We believe that is just what we did with our top three picks and our one bonus product. If you need speakers for your boat, beach house or just outdoor use, consider any one of the marine speakers on our list. You will have no problem enjoying outdoor fun with great music to accompany you.